The process of detoxification has been going on the second you were born. Your body is constantly busy removing toxins and substances that are harmful. Today that is not an easy task to complete. Your body is more susceptible to harm than it has ever been through before. By understanding this process of detoxification your body goes through you will be in a better position to help your body stay healthy. When your body is in good working order, that is, when all your organs are working properly, your body uses the “good foods” you eat and eliminates the “bad foods.” The good foods are used for energy and supplying vital nutrients your body needs to repair itself. All your organs work together to eliminate toxins that enter your body, whether by food, by air, or by touch. Each organ has a certain job to fulfill. If one organ is not working properly, or efficiently, this hardship is passed off to another organ. Over time, if this process of hardship continues to grow, eventual collapse of eliminating toxins will happen. Your skin is the biggest organ of your body. Its most prominent role is to provide a shield by filtering any invading substance that may be harmful to your body. This is the first line of defense your body has to protect itself. The second line of defense is your lungs and digestive tract. These organs also filter out toxins and other substances. Your lungs will cause you to sneeze, cough or spit to remove unhealthy substances from the air you breathe. Your digestive tract will work to breakdown any harmful substance and expel it from the body that is ingested from your mouth. If a harmful substance manages to surpass these first lines of defense, it becomes the job of the kidneys and liver to neutralize it. They send the neutralized substance to your colon, bladder, skin or lungs to be expelled. Your skin can only filter out water-soluble chemicals. Other fat-soluble chemicals, like in lotions or petroleum-based solvents, get absorbed directly into the bloodstream. Same is true for your lungs. Any fat-soluble chemicals, like neurotoxins, do not get expelled and get absorbed into the bloodstream. Your digestive tract does the brunt of detoxifying once foreign substances enter the body. This includes the stomach, large and small intestines, which blocks some of the toxins and sends them directly to the colon. But most toxins that enter the digestive tract are sent to the liver. The liver uses enzymes and antioxidants to chemically neutralize toxins. Depending on the amount of toxins or the severity of these toxins, your liver may become under stress to neutralize them. Any toxins that reach your bloodstream are then detoxified by your kidneys. The average amount of blood that your kidneys process is about 200 quarts of blood a day, which will sift out about 2 quarts of waste product. It needs to be noted that this is the normal procedure when all body organs are in good working order. However, when the toxic exposure is too high and the organs are compromised, toxins are deposited in your fat cells for “temporary” storage. Only when high levels of toxins in the body decrease can your body resort to cleaning out the “stored” toxins within your fat cells. This is why consuming a diet of high nutrients is so important. This gives your body a fighting chance to not be overcome by an overload of toxins. Your immune system is like a bank vault full of money. Every time it is attacked by toxins, a certain amount of money is paid to stop the attack. Without more deposits of nutrients, your balance of money eventually runs out. When this happens, illnesses and diseases will surely occur. Accumulation of toxins in the body can overwhelm your organs and damage them. When your body is continually ingesting more toxins than it can detoxify, these toxins have no other place to go. These toxins get stored away as a means of protecting the body. Many diseases and conditions are caused by this type of toxic accumulation. Diabetes can happen when your body has an accumulation of solvent-type toxins that are present in your pancreas, for example. Your immune system is designed if it can not kill the toxins, it quarantines the toxins in a cyst, which is like a cocoon that traps the toxin to protect your body. Your white blood cells are taught not to attack the body, which in this case, the cyst is now a part of the body. The cyst is left alone to live and attract other toxins and bacteria. These toxic substances are secretly hiding in what may seem like “harmless” sources you take for granted such as the food you eat… the water you drink… the air you breathe… the carpet you walk on… even the shampoo you use for your hair! Our exposure to toxic chemicals far exceeds anything in our history! In fact, every single week approximately 6,000 new chemicals are listed in the Chemical Society’s Chemical Abstracts. Recent statistics confirm that U.S. industries manufacture and import some 75,000 chemicals. But the current regulatory system does not require comprehensive testing of chemicals before they are put into products and it does not provide authority to the U.S. Environmental Protection Agency (EPA) to prevent harmful chemicals from being used in products and released into the environment. The EPA — the agency that was created to protect human and evironmental health — has issued regulations to control only NINE of these 75,000 chemicals since the enactment of the federal Toxic Substances Control Act in 1976. A 1998 study by the Environmental Working Group looked at 13 organophosphates, which are derivatives of nerve gases developed by Nazi Germany. These pesticides have been used widely for 40 years against scores of agricultural pests. Their findings were shocking… showing that an estimated 1.1 million children under the age of five each day were eating food that contains an unsafe dose of one or more pesticides. Of these children, 106,600 exceeded the FDA’s safe daily dosage level by 10 times or more! Pesticides, Chemicals and Toxins Will Even Attack Your Unborn Child! A startling investigation of newborn babies born in the US in 2004 revealed that of 413 industrial and consumer product chemicals tested, these babies averaged 200 contaminants in their blood! 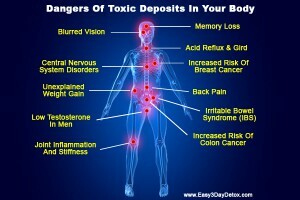 The only way to remove these toxins is through careful and diligent use of a natural body detox. Done periodically, you give your body the power to heal itself. Let thy food be thy medicine and thy medicine be thy food. Your body is ready and willing to clean out and regenerate itself. All it needs is a little help from you! If you are ready to be healthy and to avoid getting sick, even avoid developing an incurable disease, you owe it to yourself to detox your body, the gentle way. It is painless and can even be done on a budget. Just a slight change in your diet is all it will take. Return to What is a Body Detox?